I own a simple silver bangle bracelet that I like very much, but I have always wanted bangles that I can layer. I like my jewelry to be unique, so I want something more than 2 or 3 plain bracelets layered together. I did find two matching bracelets, each engraved with six inspirational words, but one of them is currently out of stock. I'll be watching it closely and will share them here if I end up buying them. 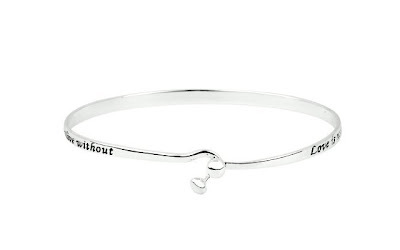 This romantic engraved bangle bracelet is one I am seriously considering. The romantic message engraved on this bracelet is "Love is not finding someone you can live with, it's finding someone you can't live without." The only reason why I hesitate to purchase it is because the catch clasp style would not layer well with my existing ball-closure bangle. If the one bangle of the two I have my heart set on does not come back into stock, then I may just purchase this one and two thin plain bangles to layer it with.